The worst known case of workplace lead exposure at a U.S. range happened during renovations at Wade’s Eastside Guns in 2012. But documented hazards there go back to 2008. When Wade Gaughran, owner of Wade’s Eastside Guns and Bellevue Indoor Range, expanded his business in 2012, 46 workers were contaminated by lead. As the range stayed open, public-health officials worried that customers were at risk, too. In a cramped hotel room on Christmas Eve, a pale and hollow-eyed man embraced his two children and whispered they’d be OK. Despite his assurances, Manny Romo, a 34-year-old ironworker, wasn’t so certain about the future. Will I die? he wondered. Who will take care of my family? An invisible assailant had invaded the bodies of Romo and his two kids, attacking their bones, brains and nerves. They were contaminated with lead. And it came from an unexpected place. In fall 2012, Romo had inhaled lead while helping erect a second story on Wade’s Eastside Guns and Bellevue Indoor Range. He was never warned about lead hazards from spent ammunition at the worksite and unknowingly tracked the poison home to his children. Shortly before Christmas 2012, the Romo family evacuated their Auburn home, fearing for their safety and leaving behind contaminated furniture and toys. Romo was one of 46 people contaminated by lead during the Wade’s renovation — the worst known case of occupational lead exposure at an American shooting range, according to public-health officials. Manny Romo brought lead home from his construction work at Wade’s, unwittingly poisoning his daughter, Serenity. Over the past decade, thousands of workers and shooters across America have been exposed to unsafe levels of lead at gun ranges, inhaling lead dust or absorbing it by contact with lead-covered surfaces. The 2012 contamination was the latest of several lead-poisoning cases at the Bellevue gun range, where owner Wade Gaughran has repeatedly put his workers in danger and the public at risk, a Seattle Times investigation has found. The construction company and subcontractors during the 2012 project also did little to protect their workers or educate them about potential hazards at the shooting range. State workplace-safety officials, whose mission is to protect workers, also failed to act quickly after being alerted to the widespread lead exposure there. Wade’s offers a stark example of a little-known national problem that impacts workers and the growing ranks of recreational shooters: Owners have been running dirty ranges for years yet face little or no scrutiny from state and federal safety-and-health regulators. Over the past decade, thousands of workers and shooters across America have been exposed to unsafe levels of lead at gun ranges, inhaling lead dust or absorbing it by contact with lead-covered surfaces, The Times has found. Range owners who don’t properly clean or ventilate shooting ranges are the primary culprits. Sometimes, owners know about the risks, but simply ignore them. Others are ignorant of the health hazards posed by lead — a debilitating toxin that can even cause death. Since the 2012 case, Gaughran has hired a health-and-safety firm to control lead exposures. Managers are trained and oversee a new lead-compliance program. L&I officials said based on their latest monitoring last year, the gun range is safe for workers and the public. Gaughran also said he has invested $2 million on a custom-built ventilation system and new bullet traps. Shooters fired into a sand berm at Wade’s Eastside Guns and Bellevue Indoor Range. Over time, lead built up in the berm and became a health hazard when it was removed. Guns were just a weekend hobby for Gaughran until he saw how much money could be made from them. While selling insurance in the late 1980s, Gaughran went to the Puyallup Gun Show for fun on weekends. 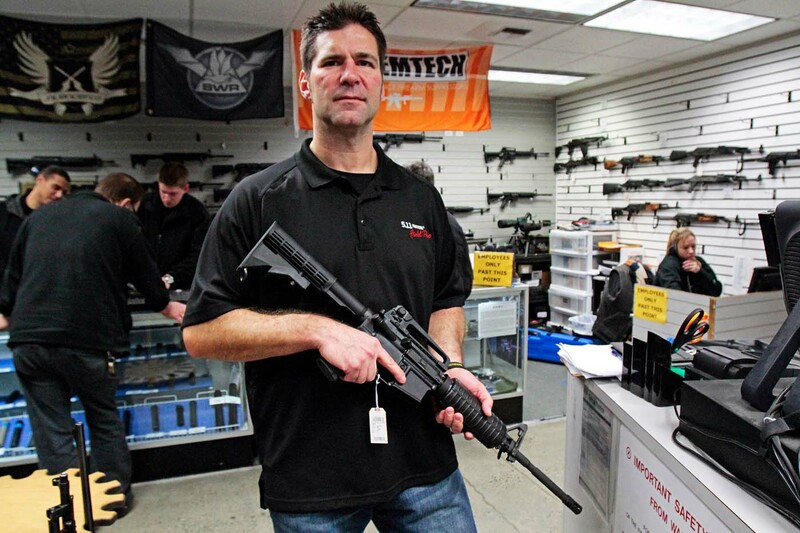 Soon, Gaughran ditched his “suit-and-tie” job and opened a small gun shop in Bellevue. Eventually, he purchased land on Bel-Red Road where he envisioned building a bigger shop with a shooting range. This Google Street View image in 2011 shows the bus stop next to Wade’s Eastside Guns and vents on top of the building. The next year, when work began on a second story, the unfiltered vents spewed lead dust; 46 workers were contaminated during the project. He finally opened Wade’s Eastside Guns in 1996, building it over the years into one of the largest gun stores and indoor firing ranges in the state. But in summer 2008, Gaughran had a problem. He hadn’t kept up with the tons of spent ammunition that filled his shooting range. Shooters had fired so many bullets into a sand-berm backstop at the end of the shooting lanes that it caused the back wall to split. “We were breaking out the back wall of the building” with a half-million pounds of sand and lead pushing against it, Gaughran recalled. The sand berm was so packed with spent ammo that incoming bullets occasionally struck metal and ricocheted back toward shooters, or escaped the building, two workers have said. Wade Gaughran explains how tons of lead cracked an outside range wall. That summer, William Sweat, of Kirkland, was waiting at a bus stop outside the gun range on Bel-Red Road when he heard gunfire and something whiz by his head. “I don’t know how the hell this shrapnel was coming out of the building … but it damn near hit me in the head,” he said. Sweat showed “a mangled-up bullet” that escaped the range to a man working inside Wade’s who told Sweat he was the owner. After the man dismissed his complaint, Sweat called 911. An officer responded and reported he found no holes in exterior walls and closed the case. Gaughran denied it happened. To solve his problem with the berm — and to cash in on the lucrative scrap metal inside it — Gaughran offered cash, guns or store credit to employees to help remove the sand berm and sift out the tons of spent lead, which was worth up to 70 cents a pound. Gun salesman Roberto Sanchez and range safety officer Sean Eals agreed to the extra duty. But they knew little about the dangers of lead removal and said they were given no training. Gaughran gave them gloves, protective coveralls and paper dust masks, but they recall he didn’t initially supply them with respirators required for such work. After removing the sand berm at Wade’s in 2008, Roberto Sanchez fell ill. His blood lead level was the highest state officials had seen for a gun-range worker. Following their regular shifts, the two men and others worked through hot August nights, mining lead in the hours before the gun range reopened in the morning. Sanchez used a forklift to break up compacted sand into chunks, then Eals scooped them up with a Bobcat and dumped them into a screening machine that sifted out the lead. The workers then hauled out the metal and dumped it in a large, open container in the parking lot. During cigarette breaks, Eals recalled, workers shook off the lead from their bodies. “You could just feel the heaviness of it in your hair — or in your nose or eyes,” said Eals, who grew increasingly agitated as if he’d been drinking coffee all day. Some workers spontaneously vomited. Sanchez’s joints and muscles ached, he felt dizzy and drained, and his head throbbed. One morning, Sanchez woke up hardly able to move, with pain shooting through his lower back. “It felt like somebody was stabbing me in the kidneys,” he said. He crept out of bed to his car and drove to the urgent-care unit at the Veterans Affairs hospital in Seattle. A doctor there took blood tests, and later told Sanchez the amount of lead in his blood was off the scale. The tests showed he had 83.5 micrograms of lead per deciliter — 70 times the blood-lead amount of an average person, 1.2 micrograms. Health problems can occur at 10 micrograms per deciliter, according to the Centers for Disease Control and Prevention (CDC). Lead is particularly dangerous because at lower levels symptoms usually don’t appear, even as it damages a person’s body. The VA reported Sanchez’s dangerously high test result to the state’s Adult Blood Lead Epidemiology and Surveillance (ABLES) program. Supervised by Washington’s Department of Labor and Industries (L&I), the program collects and tracks data on lead exposure. When workers’ blood-lead levels are high, ABLES officials can alert L&I’s enforcement arm so it can inspect workplaces for safety and health violations. The lead level in Sanchez’s blood was the highest reported for a shooting-range worker in Washington recorded by the ABLES program. Over the past 10 years, at least 89 workers at Washington shooting ranges had blood-lead levels that the Centers for Disease Control and Prevention considers harmful. Explore test results at the shooting ranges. 10 micrograms per deciliter: CDC considers this level elevated for the public and it may be harmful. 25 micrograms per deciliter: A worker has been overexposed to lead and serious health problems can occur. 60 micrograms per deciliter: Employee must be removed from work area until lead level decreases. 100 micrograms per deciliter: Severe brain and kidney damage can occur. Sanchez's doctor and L&I officials notified Gaughran’s business that Sanchez shouldn’t perform work that would expose him to lead. State and federal standards require a “medical removal” of any worker whose blood-lead level exceeds 60. Sanchez’s doctor also advised him to start emergency chelation therapy — a risky procedure that involves taking medications to help flush heavy metals from the body. After Sanchez, five other employees got tested and found high lead levels in their blood. All tested above 34, including Eals, at 62. Both Sanchez and Eals were put in jobs in the gun retail area. But other than interviewing employees by phone and exchanging information with Gaughran, blood-surveillance officials didn’t alert L&I’s enforcement arm to investigate Wade’s shooting range, which could have led to citations and fines. A Times analysis found that of the gun ranges not inspected from 2004 through May 2013, ABLES received 40 blood tests of employees with high lead levels. Todd Schoonover, research manager of ABLES, refused to be interviewed by The Times to explain his decisions; L&I officials said protocols for making referrals are complex and no blood-lead test at any level requires an inspection. At Wade’s shooting range in Bellevue, L&I inspectors determined that lead dust blew unfiltered through the building’s exhaust fans and onto workers across the rooftop. In a September 2008 email to L&I officials, Gaughran said he was changing workplace practices and dealing with his range’s lead problems. “We understand the seriousness of the issue and will address anything and everything needed,” he wrote. But Gaughran didn’t keep his promise. Two years later, in mid-2010, six workers at Gaughran’s range tested at 25 micrograms or higher for lead in their blood, including one result of 41. The overexposed employees’ duties included helping shooters in the range, dry-sweeping the floor and working the retail area. He informed a colleague on June 30 the cluster “implies that the facility is likely deficient in basically everything.” Schoonover’s email said he already referred the case to inspectors, noting Wade’s had never been inspected. Records show the gun range had workers with lead levels as high as 42 in 1996. When L&I receives a referral about a serious hazard, regulations say it must inspect as soon as possible but no later than 15 working days. But L&I officials couldn’t explain why six weeks had passed before a state industrial hygienist opened an inspection at Wade’s on Aug. 13, 2010. She eventually found seven violations, including two serious ones. L&I issued a $350 fine. About six months later, a manager at Gaughran’s range told L&I in writing the violations had been fixed. By 2011, Gaughran had decided to expand his business by adding a second story to his popular gun store and range. His architect, in a March 2011 building permit for the city of Bellevue, answered “NONE” to describe potential environmental health hazards during the project. During the construction, he said, special filters would be installed to remove lead and gunshot residue from the air. Gaughran selected S.D. Deacon, a general contractor with offices in Bellevue, Portland and several California cities, for the $2.6 million project. Unlike another bidder, S.D. Deacon promised to mostly keep the firing range open to the public while it built the second story, renovated the range, installed a ventilation system and built a new bullet-trap system. But S.D. Deacon wouldn’t take on one part of the job — removing the tall sand berm contaminated with tons of lead. Once again, Gaughran hired his own employees in the fall of 2012 to mine the sand pile. He would later say it was at least the 15th time workers had mined the lead. As in the past, Wade’s workers received little or no training and wore scant protective gear, records show. By sunrise, when workers left their overnight shifts, lead particles painted their faces and lead dust coated their lungs. After several weeks, the workers had removed about 100,000 pounds of recyclable lead. Another 578 tons of lead-contaminated sand filled 30 semi-trucks, which hauled it to the Doe Run recycling center in Boss, Mo. Signs on a door at Wade’s warn those entering the shooting range about lead exposure. Unlike for workers, there are no state or federal standards for safe levels of indoor airborne lead for the general public. During the early stages of construction in fall 2012, Leonard Guthrie, S.D. Deacon’s superintendent in charge of the construction, believed that lead just wasn’t a problem. He’d seen children in the shooting range and observed Wade’s employees cleaning it without full protective equipment. Guthrie would later tell a state investigator that when he pressed Gaughran about lead, the gun-range owner swore at him and told him to shut up. After a while Guthrie stopped asking about lead hazards. On Sept. 10, 2012, an environmental company hired by S.D. Deacon sent an alarming report to the contractor. Med-Tox Northwest tested the gun range and found it “severely contaminated” with lead, at 435 times the guidelines for surfaces. Even the ceiling’s fiberglass insulation was loaded with lead. But Guthrie and other managers didn’t halt the project. Med-Tox Northwest created a lead-compliance program for S.D. Deacon and its subcontractors that included training, respirators, employee blood-lead tests, daily air-quality monitoring, and a decontamination room. Under this plan, Wade’s firing range would only be open to the public if its air had fewer than 30 micrograms of lead per cubic meter of air averaged over an 8-hour period. That standard is the federal Occupational Safety and Health Administration’s (OSHA) exposure level that triggers extra protections for employees. To save money, S.D. Deacon officials would later say, the company decided to implement the entire lead program itself, even though it had no experience in lead abatement. S.D. Deacon safety manager Glen Kuntz “skimmed” Med-Tox’s contamination report and proposed compliance program, he later told an L&I investigator. He purchased a “negative air machine” to push the lead-contaminated dust out of the range as well as equipment for a decontamination room. But S.D. Deacon employees never set it up and Kuntz returned the equipment. The S.D. Deacon team also did not test the air to determine if the range was safe enough to be open to the public, as Med-Tox Northwest had recommended. S.D. Deacon officials later told L&I that they had provided some protective gear to workers, but some refused to wear it. Several workers — including Romo, who worked for subcontractor Brooks Steel — said lead wasn’t discussed during weekly safety meetings. 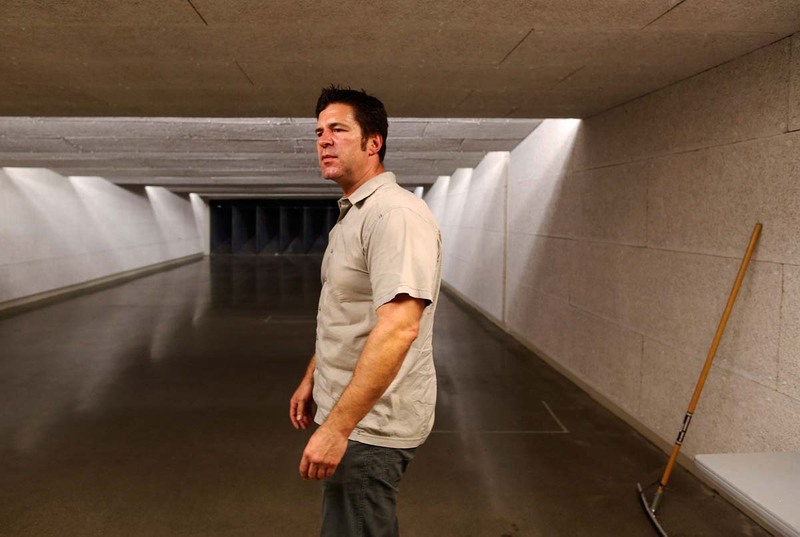 As Romo and others demolished parts of the shooting range, they had no idea lead polluted it. In mid-September 2012, Wade’s workers tore down ceiling insulation at night with long pike poles. The air was so thick with lead dust that they couldn’t see in front of them, one Wade’s worker said. It clung to their lungs and skin. Over several long nights, they stuffed 200 garbage bags full of lead-laced insulation. One night, Wade’s employees made a short video of the insulation removal, documenting their lack of protection and expressing fear of lead contamination. Soon workers complained of tremors, severe headaches, fatigue, irritability, stomach cramps and loss of appetite. One of them went to the doctor and discovered his blood-lead level had reached 48. A few days later, his high test results were reported to the state’s blood-lead surveillance program. By then, one worker was vomiting. In November 2012, as workers built a second story on Wade’s, L&I received a call about lead spewing unfiltered from fans on the roof. An official told the caller the agency was already aware of lead contamination there, but it hadn’t been inspected. L&I inspectors noted a 24-foot-wide circle of lead residue around exhaust vents on the roof of Wade’s Eastside Guns. A “bulk sample” collected near one exhaust vent showed the material was 40 percent lead. Tests taken Nov. 27, 2012, at Wade’s detect the presence of lead. 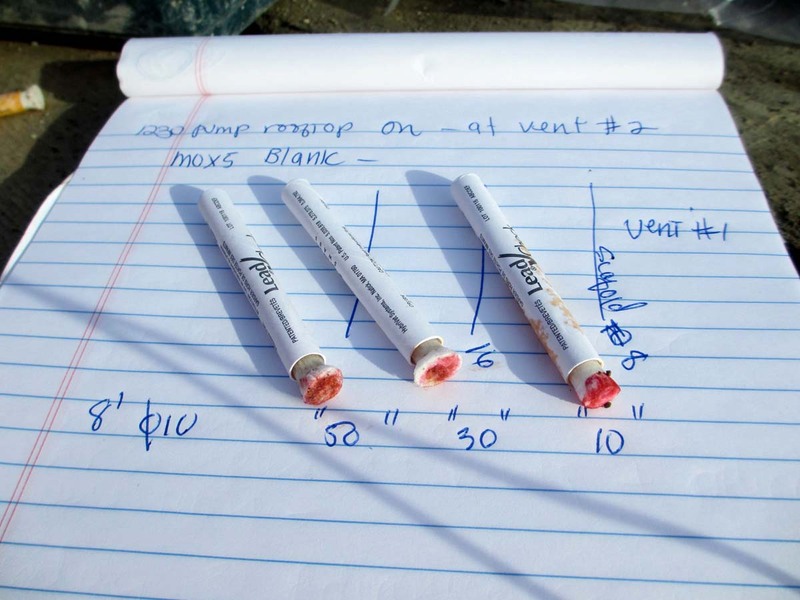 Swabs that turn pink or red show a hazardous level of lead. Lead tests at Wade’s detect the presence of lead. Swabs that turn pink or red show a hazardous level of lead. Telephone message: L&I compliance manager Venetia Runnion informs Public Health — Seattle & King County of lead exposure at Wade’s Eastside Guns, three weeks after a bricklayer first told L&I that the general public was being exposed there. In early November 2012, bricklayer George Dunn worked next to a large exhaust fan on the roof of the Bellevue shooting range when he heard a noise that startled him. First, he said, he heard the “pop, pop, pop” of gunfire, followed immediately by the “ping” of metal spiraling through the fan next to him. Bullet fragments rattled inside the vent and then spewed out, with no filters catching them. “It was spitting all the lead chips out and exposing everyone, blowing all over,” he would later say. A bricklayer for 25 years, Dunn had worked for about three weeks with a crew building the second story. Dunn and other crew members repeatedly had been told their work on the roof didn’t pose any health risks, and he said S.D. Deacon, the contractor supervising the job, hadn’t issued any special protective gear. But when co-workers started acting edgy — and he started feeling strange himself — Dunn began having doubts. He noticed a 20-foot wide circle of thick, gray dust around the fans. The next day, Nov. 8, 2012, Dunn called L&I about the unsafe workplace. Dunn, who never got his blood tested, asked an L&I official about the health risks of lead exposure and explained how lead dust spewed onto workers and others at the range. The official told Dunn that L& I already knew about the lead problem there. A couple of weeks earlier, the agency had received blood results for two workers there who had elevated lead levels. She recommended that Dunn drink orange juice to help reduce any lead absorption, he recalled. L&I didn’t contact public-health officials until more than three weeks later. On Nov. 13, near the end of the 15 business-day deadline to open an inspection, L&I officials showed up at Wade’s. “Timing was very quick that we got out there,” said Venetia Runnion, an L&I manager on the inspection team. Inspectors interviewed workers, tested the air and swabbed surfaces for lead over several weeks before ultimately determining what Dunn had told them was true. During the visit, Gaughran was cooperative, Runnion said. In all, inspectors would find 18 violations, mostly related to poor ventilation, lack of training, and high lead levels on surfaces and in the air. Meanwhile, L&I notified S.D. Deacon on Nov. 15 that its whole crew should get blood tests to find out if they’d been overexposed to lead. Twenty-six of them turned out to have high lead levels. S.D. Deacon’s foreman had the highest at 153 micrograms, more than 127 times average. Concerned about the rash of lead cases at Wade’s, Runnion noted in an email to colleagues and to Gaughran and his managers that the public was still shooting there, despite its toxic condition. In one of the shooting bays, customers would be exposed to the maximum allowable 8-hour airborne standard for workers in just 49 minutes. L&I had the power to shut down the poisoned shooting range until Gaughran had it decontaminated. The agency had considered taking this drastic step — an “order and notice of immediate restraint” — against another dirty gun range once before, but did not do so. Still, Gaughran kept it open. 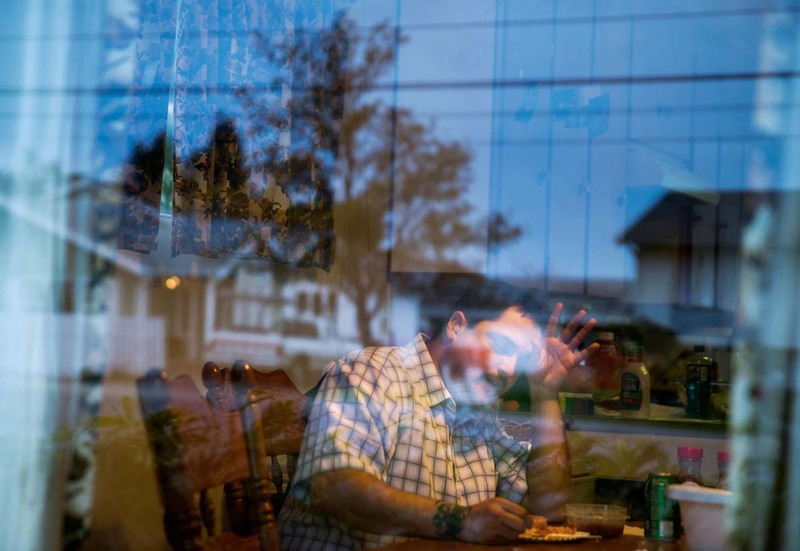 Ironworker Manny Romo still feels the effects of his 2012 lead poisoning at Wade’s. Romo and his family had to abandon their contaminated Auburn apartment and belongings. For several months in fall 2012, Manny Romo tracked poison into his car and then into his home on his heavy, lead-caked work boots and clothes. As his 5-year-old daughter, Serenity, played on the floor, she got lead on her skin, clothing and toys. His 13-year-old son, Devin, absorbed lead that had settled on furniture and tools. Serenity started vomiting. Her blood-lead level was above what the CDC considers high for children. Teachers complained Devin was in a stupor and his grades were slipping. He too had been contaminated. • The state Department of Labor and Industries (L&I) improperly delayed releasing the records for several months. • Wade’s and construction contractor S.D. Deacon sued The Times and L&I to halt release of the records, claiming they contained proprietary information. A King County Superior Court judge eventually tossed out the lawsuits against The Times and fined the state $502,827 for violating public-records law and for not following her order for immediate release of all of the inspection files. The judge also ordered the state to pay $43,682 to cover the newspaper’s attorneys’ fees and costs. The Times’ pursuit of these documents had begun in January 2013, when it asked L&I for records about the agency’s lead-poisoning inquiry into the Bellevue range. In reply, L&I cited an exemption to the state Public Records Act for ongoing investigations but failed to provide further explanation, as required. By early May 2013, L&I had cited Wade’s for serious violations and closed the investigation. In June, it cited S.D. Deacon, which was building a second story at the gun range. But it wasn’t until July 25 that L&I informed Wade’s and the contractors that inspection files would be released to The Times on Aug. 9 — unless they obtained a temporary restraining order from a judge to halt disclosure. Wade’s and S.D. Deacon sued to stop the release but never obtained a restraining order. The Times countersued the two companies and L&I. At a Sept. 12, 2013, hearing, Shaffer determined that the files, which totaled several thousand pages, had been illegally withheld. She ordered L&I to disclose them immediately. Even so, it took the agency eight more days to make all the records public. L&I has appealed the judge’s order to the state Supreme Court, which hasn’t decided whether to take the case. Romo felt numbness and tingling in his feet and hands. His stomach ached and he couldn’t concentrate. His blood test on Nov. 20 revealed a 73, one of the highest of anyone exposed at Wade’s. As required, his employer removed him from the job. His wife, Katrina, tested at normal levels. Romo and his family evacuated their Auburn apartment about a week before Christmas. After tests showed the family’s apartment contaminated with lead, Romo compiled a 28-page list of possessions that were taken from them. It included a hand-knit blanket from Romo’s grandmother, Serenity’s books and Devin’s Star Wars collection. On Christmas Day, the Romo family moved back into their decontaminated, nearly empty apartment. After two months, they moved out again because Serenity’s blood levels hadn’t dropped. Abatement crews removed lead from several other workers’ homes and cars, and even had to decontaminate 10 rooms at a Bellevue hotel where workers stayed during the construction. After L&I alerted Public Health — Seattle & King County about several workers poisoned at Wade’s, Dr. David Fleming raised concerns. L&I feared Wade’s customers who used the range, which was open off and on for the past four months, had been contaminated. L&I officials wanted Public Health to halt the shooting range renovation and close the facility to shooters, the health agency’s emails show. Fleming’s office quickly responded, asking Gaughran to provide a list of active shooters so it could notify them about the lead problems and recommend blood tests. Gaughran didn’t provide names, saying he had no frequent shooters at the range. On Dec. 10, Public Health officials asked Gaughran to voluntarily close his range so that lead could be safely removed from the building. But Gaughran became “combative” about any hint of closing, Public Health emails show. “Just because there is lead on the floor, benches or shooting partition does not mean the customers or employees are getting lead into their bodies,” he responded to the agency the same day. With no blood tests of customers, health officials lacked proof that any member of the public was overexposed to lead. However, numerous cases across the country illustrate that shooting enthusiasts have suffered lead poisoning at gun ranges. Behind the scenes, a King County public-health official drafted a health order that showed the agency had the authority to shut down the range. When officials said they would visit to get more evidence of contamination, Gaughran closed the range the next day, Dec. 11. Within days, Gaughran laid off some employees and fired several others, including at least two men who had lead poisoning. They contend that Gaughran fired them because they had had their blood tested for lead and questioned the range’s safety. Gaughran had promised to give a gun or a $450 gift certificate at the gun shop as a bonus to workers who helped remove insulation and lead from the berm. But he refused to give the bonus to two of the men, they said. He said he fired some employees because they weren’t reliable. Employees were trained and educated about lead hazards, Gaughran said, and any workers who claimed they became sick were simply careless or later motivated by money. He hired an environmental cleanup company and reopened parts of the range four days later, contrary to Public Health’s request. At Public Health — Seattle & King County, officials like Director of Environmental Health Ngozi Oleru were flummoxed as they tried to deal with Wade’s as a potential public-health threat. While laws protect workers from airborne lead, no regulations are in place to shield the public while indoors. Could the county test customers for lead, and if results were bad, close the firing range? That situation had never been tackled before. With little help from Gaughran, the county sought advice from Mary Jean Brown, a scientist with the CDC. According to the county, Brown replied that it lacked air-monitoring evidence showing customers were at significant risk and to not worry the public about it. 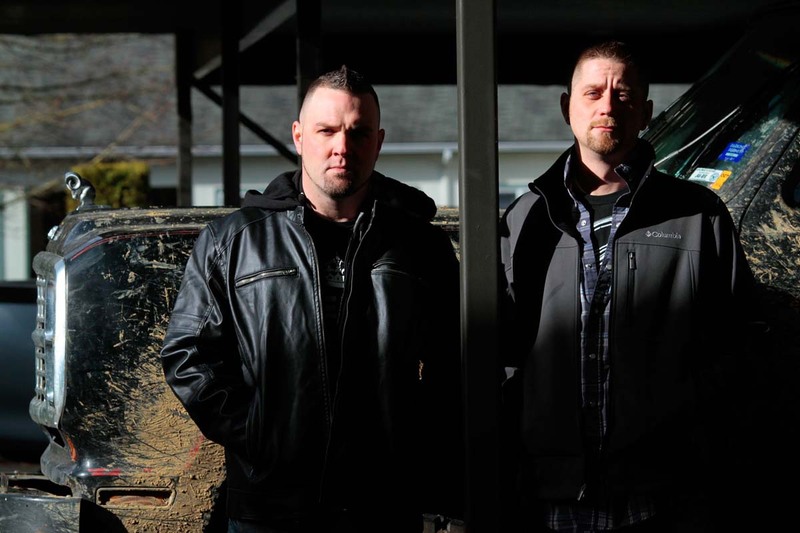 Ironworkers Chris Seavoy, left, and Joe Schmidt are among several construction workers who filed lawsuits against Wade’s Eastside Guns and contractor S.D. Deacon, saying they developed lead poisoning from remodeling the shooting range. So Public Health officials sought proof, asking Gaughran for shooters who would volunteer for a lead-air exposure evaluation after a new ventilation system had been installed and the building remediated. If these customers had breathing exposures higher than what OSHA allowed for workers, then Gaughran would have to close his business again, Oleru warned. At that point the public had little knowledge lead was a problem at the range other than notices taped on a door to the shooting range. During Ladies Night on Dec. 18, six men volunteered to be monitored while shooting. Three of them had “personal breathing zones” of lead higher than what OSHA allowed for workers. When Public Health shared the alarming results with the CDC, Oleru realized she had a problem. Unlike for workers, there are no state or federal standards for safe levels of indoor airborne lead for the general public. “The science is not available,” she told The Times. That made it difficult to conclude whether Wade’s had harmed shooters and what to enforce, she said. “What’s the hammer we have?” the frustrated Oleru asked. The public only discovered the lead problem when two employees of Brooks Steel, a subcontractor on the project, told their stories of becoming ill to The Times and other local news outlets. Oleru said her agency asked but never did receive further air-quality tests from Wade’s. But by the spring L&I had indicated the range had passed tests showing it was safe for workers and ultimately the public. Wade Gaughran, owner of Wade’s Eastside Guns in Bellevue, says he has invested $2 million in new ventilation and bullet traps. This is one of the newly constructed shooting bays. Based on monitoring last year, L&I officials now consider the range safe. Washington’s Department of Ecology continues to list Wade’s Eastside Guns as a contaminated site after tests showed lead levels above standards in soil near the building. In 2013, 20 cubic yards of lead-contaminated soil were transported to a hazardous-waste facility. Owner Wade Gaughran has not yet provided the state with documentation showing the area has been fully remediated. “Lead poisoning is no joke,” Roberto Sanchez said. More than six years after his poisoning at Wade’s, Sanchez, 44, says his hands shake, his equilibrium is off and he suffers dizzy spells. The dull, biting pain that permeates his joints and muscles and fluctuates from annoying to unbearable is the worst. “Nobody should have to go through pain for the rest of their life,” said Sanchez, who quit Wade’s in 2011. He tried several medications for the nerve damage, but they either made him suicidal or didn’t work. He recently started acupuncture. Sanchez now owns his own gun shop in Monroe. When he shoots, which is rare, he does so outdoors. Sanchez said he’s angry at Gaughran for his disregard of employees. “You figure after the first time people got sick, it would have stopped,” he said. Last year, L&I at first decided to deal a heavy blow to Wade’s Eastside Guns, issuing two “willful” violations — the most severe class of penalties. But an agency lawyer overruled that choice. She said there was no proof Gaughran was aware of L&I’s 2010 inspection and citations, even though David Geisert, a range manager from 2010, told The Times he had discussed the lead problems at length with Gaughran and another manager. L&I inspectors never tried to interview Geisert. L&I’s own records also show Gaughran exchanged emails with state officials after Sanchez’s poisoning in 2008, vowing even then to solve lead problems. Three companies working on the Wade’s addition were cited for workplace violations. For the 2012 mass exposure, Wade’s was originally fined $23,480, but after an informal appeal, the parties settled for $17,920. The case alarmed health director Fleming enough that he asked Gov. Jay Inslee and L&I to strengthen the lead standards. “Washington State’s current standards put workers and their families at risk,” he wrote in his petition, suggesting workers should be removed from the workplace when tests show exposure at much lower levels of lead. L&I denied the petition, stating it would wait to see what happens in California, where officials are considering a similar proposal. The construction project at Wade’s still haunts S.D. Deacon’s safety manager, Glen Kuntz. Had managers simply hired an outside environmental consultant to routinely test for lead, Kuntz said, he would have known about the dangers and prevented much of the exposure. • If you believe you’ve been overexposed to lead, see a medical provider to have your blood tested for lead. • To determine whether surfaces you come into contact with have lead contamination, use instant lead-check swabs, which turn red if lead is present. Test kits are available at hardware stores. • Use special hand soap or wipes, such as D-Lead brand, which remove lead and heavy metals from the skin. • To talk to a specialist about lead safety, call 1-800-424-LEAD (5323), and press option 1 then 9. For more information on the hazards of lead and lead-based products, go to epa.gov/lead. More than 10 workers sued Gaughran and S.D. Deacon. They settled the lawsuit for an undisclosed amount in June. An S.D. Deacon executive declined an interview, citing ongoing litigation. During an appeal of his fines and violations in July 2013, Gaughran told an L&I hearing officer he remained bitter about the experience. For ironworker Manny Romo, who unknowingly contaminated his children, his primary concern is the possible long-term health effects on them. He and two other workers are now suing Wade’s and S.D. Deacon. Lewis Kamb: lkamb@seattletimes.com or 206-464-2932. On Twitter @LewisKamb. Staff reporter Justin Mayo and former Times reporter Keith Ervin contributed to this report.